Item: CVA 78-066 - President MacKenzie making a presentation to Princess Elizabeth at U.B.C. Item is a group photograph on the occasion of the awarding of honorary degrees by the University of British Columbia at the spring congregation. Individuals in this photograph are (left to right): (back row) Leonard Sylvanus Klinck (U.B.C. President Emeritus), Hon. Eric Werge Hamber (U.B.C. 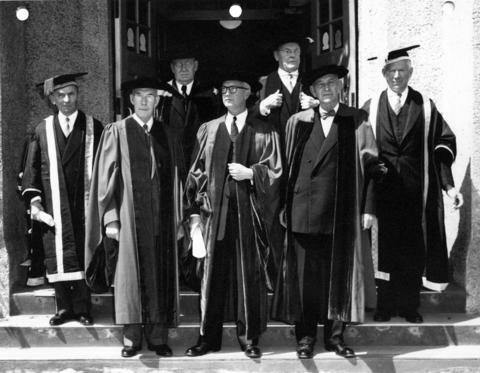 Chancellor Emeritus), (front row) Sherwood Lett (U.B.C. Chancellor), Hector MacLeod (degree recipient, Dean of the Faculty of Applied Science), Thomas Ingledow (degree recipient), William George Swan (degree recipient), Norman MacKenzie (U.B.C. President). Three holes are punched along the top edge. Blue stamp on verso with blanks filled in: "Date May/56 Neg. No. 22 / Department of Extension / University of British Columbia / Vancouver, B. C." Written in blue pen on verso: "Spring Congregation May 15th 1956 / Back Row President Emeritus Leonard S. Klinck / Chancellor Emeritus Hon. E.W. Hamber / Front Row Chancellor Sherwood Lett / Dean Hector MacLeod LLD. / Tom Ingledow LLD / William G. Swan LLD / Pres. Norman MacKenzie".